BEAR MOUNTAIN, N.Y. — Not everyone climbs into a sport-utility vehicle eager to take it off-road. Most SUV drivers and passengers simply want to get to the next point in a city or county, preferably using a paved surface. As such, their primary concerns aren’t fording streams, crawling over rocks, or climbing and descending steep, rugged hills. It is not the stuff they brag about. Their usual automotive boast, when it occurs at all, is about fuel economy. At 29 miles per gallon on the highway, using regular-grade gasoline at a cost still below $2.50 a gallon in many U.S. communities, the stylish 2015 Jeep Renegade 4×4 Limited will provide much fodder for conversation. Renegade buyers aren’t Jeep Heavy people. The Jeep Heavy crowd — devotees of models such as the Wrangler and the Rubicon — probably would not even consider a Renegade for their personal use. They know what Jeep’s U.S. and European marketers know — the Renegade is a code-named rebel against Jeep’s rugged, but fuel-consumptive, body-on-frame build tradition. The Renegade is one of the latest children of a corporate marriage of convenience — between a bankrupt Chrysler Corp. and Italy’s seemingly always-struggling-to-expand Fiat. The merged company now operates under the name Fiat Chrysler Automobiles. The Renegade — largely based on the Fiat 500X reviewed in this column last week and 62-percent sourced from Melfi, Italy — is far more Fiat than Jeep. That is likely to be offensive to Jeep chauvinists, whose spiritual home for all things “real Jeep” — their term, not mine — remains in the bowels of the Toledo South Assembly Plant, the Ohio factory that built the original Jeep CJ, the workhorse that helped drive America to glory in World War II. What happened to Jeep and Fiat in the interim is the stuff of novels. I will shorten the story here. Let us start with Emperor Lee A. Iacocca. Well, he wasn’t an emperor — just the chairman of Chrysler, which he used to buy American Motors in hot pursuit of the Jeep brand. I always regarded Iacocca as an imperious, bona fide marketing genius. The man knew how to build a brand. Much of what anyone associated with the car business learned about marketing, they learned from him. But emperors don’t last long in the automotive industry or anywhere else. There is always someone scheming to topple them. Iacocca, largely with Jeep profits, built Chrysler into a salable cash cow. His underlings knew this, pushed him out in the late 1990s and sold the cow — to Germany’s Mercedes-Benz, of all companies. The Germans wanted Jeep but not Chrysler, which it regarded as inferior to all things in German automotive engineering. That Mercedes-Benz/Chrysler marriage, horribly abusive based on the telling of several Chrysler employees, ended in an ugly divorce barely nine years after it was consummated — although there is a lingering rumor it never was actually consummated. At any rate, Chrysler was sent out on its own into a cruel financial world corrupted by derivatives, phony real estate loans and other scams. World markets collapsed and automotive sales crumbled along with them. Chrysler went bankrupt. The U.S. government was only too happy to help Sergio Marchionne, Fiat liege and now chief executive officer of Fiat Chrysler Automobiles, pick up the pieces at a bargain price. Marchionne, one of the savviest people in the global automobile business, wanted Jeep . . . and Dodge Trucks, which now runs under the name Ram. He got what he wanted, along with a U.S. outlet for things Fiat, such as the 500X and the Jeep Renegade that is based on it. From this viewpoint, it is a pretty good deal for everybody. Many U.S. Jeep employees got to keep their jobs. Lighter, more fuel-efficient Jeeps are an environmental and economic necessity. Fiat Chrysler Automobiles knows how to make them. Bottom line: The Jeep Renegade Limited 4X4 has modest off-road capability. The Trailhawk version of this model is better in the rough. But if you are a serious off-roader, you should consider the Wrangler or Rubicon. The Renegade is a rebel only on paved roads. Ride, acceleration and handling: The Renegade gets decent marks in all three. “Decent” means everyday city-suburban commuters should be happy with this one, especially in inclement weather. Head-turning quotient: “Pretty” is an adjective usually not applied to things Jeep. It applies here. Be advised. Body style/layout: The Jeep Renegade is new for 2015. It is based on the Fiat 500X crossover platform. Like the 500X, it is offered with front-wheel or four-wheel-drive. There are four trim levels—Sport, Latitude, Limited and Trailhawk. Engine/transmission: The Renegade Limited 4X4 comes standard with a 2.4-liter, 16-valve inline four-cylinder gasoline engine with variable valve timing that delivers a maximum 180 horsepower and 177 pound-feet of torque. The engine is linked to a nine-speed automatic transmission. Capacities: Seating is for five people. Cargo capacity, with rear seats up, is enough for a week’s worth of provisions for a family of four. Put the rear seats down for a modest-haul run to your local big-box home goods store. The Renegade Limited 4X4 with the 2.4-liter engine can run on regular gasoline. Mileage: I averaged 27 miles per gallon, mostly in uphill highway runs. Safety: Standard equipment includes four-wheel disc brakes (ventilated front/solid rear); four-wheel antilock brake protection; emergency braking assistance; stability and traction control; dusk-sensing headlamps; tire pressure monitoring; side and head air bags. Note: This column strongly recommends purchase of the Jeep Renegade’s Advanced Technology Group. It will cost you about $2,000 but could save you far more than that in the daily world in which most of us drive. Price: The Jeep Renegade is on sale this summer. The Limited 4X4 starts at $26,795. Price as tested is $31,390, including $3,600 in options and a $995 factory-to-dealer shipment charge. Estimated dealer’s price as tested is $29,000. The Jeep Renegade is an all-new vehicle for 2015 and represents the company’s first venture into the small-SUV segment. Typical Jeep features, like the seven-slot grille and squared fenders, leave no doubt as to the Renegade’s family tree. But “thinking small” is exactly what Jeep, an all-America company if there ever was one, has done with its latest new vehicle, the Renegade. Famous for its Grand Cherokee, Cherokee, and Wrangler models, Jeep ventures into the small sport-utility segment for the first time with the Renegade. It is offered in four trim levels, one of which (Trailhawk) is ready to hit the woods and all of which are available with an optional sunroof with removable panels for an alfresco driving experience. Front-wheel drive versions also are available on Sport, Latitude, and Limited trims, though we’re not sure why. A 4×4 configuration is one of the things you’re looking for in a Jeep, even if you don’t have any deep-woods excursions in your future. Two different engines and transmissions are offered. A turbocharged 1.4-liter four-cylinder engine mated with a easy shifting six-speed manual transmission is standard on the Sport and Latitude models. It tops out at 160 horsepower at 5500 rpm and 184 pound-feet of torque between 2500-4000. Standard on Limited and Trailhawk versions and available as an option or in a package on Sport and Latitude is a 2.4-liter four-banger mated with a nine-speed automatic transmission. It carries power ratings of 180 hp (at 6400 rpm) and 175 lb.-ft. of torque (3900 rpm). The smaller engine delivers a combined fuel mileage rating of 27 mpg combined in either 4×2 or 4×4 setup compared to the 25 mpg (4×2) and 24 mpg (4×4) of the normally aspirated larger engine. Our test vehicle was the Latitude with the standard manual transmission, and it provided adequate punch for around town driving. It cruised well on the highway, but gearing down for extra oomph when passing on two-lane roads is advisable. Jeep has done a nice job with the Renegade’s interior. Overall quality of materials is good, and controls are arranged nicely and easy to follow to operate. Though it is considered a small SUV (more on that in a moment), it does have a little extra width which makes things comfortable for the front-seat occupants. Those in the rear might find the going a little tight in shoulder room, but legroom in the back is OK at 35.1 inches. Several different packages are offered on the upper trim levels for you to customize the interior to your liking. Standard from Latitude models on up is Chrysler’s UConnect telematics system that includes a 5-inch touchscreen (6.5 on the optional package), Bluetooth, and SiriusXM satellite radio. It’s part of a package on Sport models. Unfortunately, on our test vehicle, satellite reception had a habit of fading in and out even in what should have been clear reception areas, but that could have just been peculiar to that vehicle. All but the most exotic safety equipment like lane departure warning, front collision warning, and rearview camera (optional on the base) is standard, including electronic stability control with hill-start assist and all-speed traction control, a collection of airbags that include one for the driver’s knees, and antilock brakes with brake assist. One interesting feature. The Renegade features an electronic parking brake that releases automatically when you start to drive off — unless you haven’t buckled your seatbelt. You still can release the parking brake manually by placing your foot on the brake pedal and lifting the button on the console to drive away unbuckled, though the BeltAlert system is going to send you both audio and visual reminders of your folly. Now, about the Renegade being a “small” SUV. Probably the most impact of that is realized when it comes to room in the back for stowing items. You run out of it fairly fast, though folding the second-seats nearly triples capacity to over 50 cubic feet. MSRP for the Renegade starts at just under $18,000 for the Sport and runs up to just under $27,000 for the rugged Trailhawk. For a look at the new 2015 Jeep Renegade and some specs, check out the accompanying slide show. When it comes to minivans, the Chrysler Town & Country is at the top of many families’ shopping list. 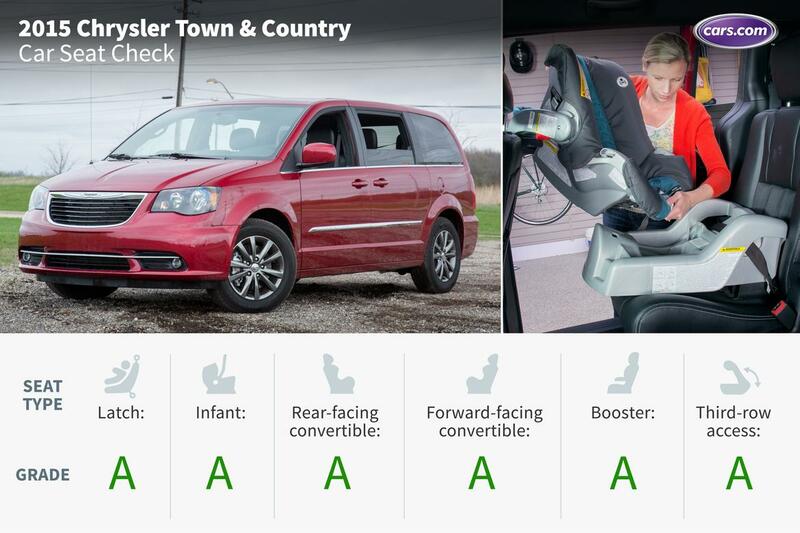 In 2014, the Town & Country ranked No. 1 in minivan sales with 138,040 sold, according to Automotive News. For the 2015 model year, the Town & Country adds more luxury with standard leather seats on base models and a standard sunroof and dual-screen Blu-ray system on Limited Platinum versions. What haven’t changed are the van’s ultra-flexible second row Stow ‘n Go seats, also standard. The two sets of lower Latch anchors in the second-row captain’s chairs were easy to use with both hooklike and rigid Latch connectors. The second row had plenty of room for our rear-facing infant and convertible seats. We didn’t need to move the front passenger seat forward to accommodate them. Both the forward-facing convertible and the booster seat fit well in the second row. The captain’s chairs recline, making it easy to get a good fit with these car seats. The forward-facing convertible installed easily into the third row, too. Third-row access is excellent because of the wide walkway between the captain’s chairs. The Stow ‘n Go seats also easily tumble forward, and the step-in height is low. The second row’s tether anchors are at the base of the seatbacks. While the tethers were easy to use, this location can be difficult for parents to find. The third row has one set of lower Latch anchors, which we like, but its location draws a negative review. The anchors are found on the larger portion of the 60/40-split seat, spanning two seating positions. This means you’ll use two seating positions when installing one car seat in the third row using the Latch system. Parents using the third row’s tether anchor will want to make sure they’re paying close attention and attaching the tether strap to the anchor and not a nearby cargo hook. Seat bolsters in the third row affected the booster seat’s fit. It sat at an angle, but we were able to push it back into an upright position. Seat belt buckles are floppy, which can be difficult for young kids to manage on their own. On a list of adjectives a marketing wiz would hitch to the Jeep brand, “adorable” and “Italian” would be near the bottom. The company’s all-new, Renegade, however, is both of those things and brand evangelists aren’t happy about it. The little truck is bolted together at a Fiat plant in the ankle-bone of Italy, the most apparent cog in Fiat’s grand plan to leverage abroad the prize of its Chrysler purchase. For a brand created in response to a 1940s U.S. military contract, this is a stretch. But Fiat is persuaded that the rest of the world wants more Jeeps—call it Americana arbitrage. And the Renegade is cute! It has all the hallmarks of its siblings: buggy headlights, big gaps around the tires, tow hooks, and skid plates. But they are all, in a word, diminutive. With its scrunched-up hood, the truck looks like a pudgy toddler in a Park Ranger uniform. The Jeep “Bambino” would have been a more apt model name. Inside, Jeep’s design team went to great lengths to keep things rugged. On the dashboard, they stamped “Since 1941.” A smartphone tray is lined with rubber etched to look like a topographic map. And there’s a beefy handle on the passenger’s side of the dashboard in case the seatbelt isn’t solace enough. From the driver’s seat, however, the vehicle doesn’t feel tiny. The car is high and boxy and the square hood looms larger in front than those of most so-called crossovers. The side mirrors are massive. With smooth clicking thermostat dials and utilitarian metal trim, this feels like driving a sturdy little toolbox. Jeep makes the Renegade in four configurations, with starting prices stretching from $17,995 to $25,995. It set us up with the penultimate “Limited” edition that offered a 2.4-liter engine, care of the Chrysler gang. (The lower two Renegades get a 1.4-liter Fiat engine.) From a standstill, the power plant provides a nice pop that city-bound drivers will like. And, apparently, the thing will tow 2,000 pounds, enough for some canoes or motorcycles. Stepping from 40 miles an hour up to 70 requires persuasion, and the truck seems happy to coast, rather than shift down to pick up steam. The platform—also care of Fiat—provides plenty of clearance and handles the rough stuff with aplomb. (The muddin’ isn’t great in the wilds of Brooklyn, but we thumped over every pothole we could find, as well as a few curbs). The experience was more solid than cushy, as if it would require many reckless decisions to make the machine rattle and shudder. That doesn’t mean the purists will buy it. They probably won’t, but Jeep doesn’t really care either way. For Fiat, the Renegade is all about pulling people into the brand. It is what car folks call a “conquest” vehicle, intended to attack rivals and tow away their loyal customers. Indeed, few other car brands have moved as quickly as Jeep has done since Fiat slid into the driver’s seat. In the past three years, U.S. sales have surged by 65 percent, handily outpacing the market at large. Globally, Jeep sales surged 39 percent last year and topped 1 million for the first time, thanks in part to more offerings such as the new Cherokee, which hit dealerships in late 2013. Last week, Fiat-Chrysler said it will make a massive, luxurious model aimed at the Range Rover and Escalade set. The Renegade, meanwhile, is tuned to carry the company into urban and foreign markets, where space comes at a premium. Just try picture a Grand Cherokee making cobblestone laps on the piazzas of Rome or the coffee shops of SoHo and you’ll get a sense of the product strategy. It might be seem silly to some, but the Renegade won 4,200 Americans buyers in April, the second month it has been in U.S. showrooms. When it comes to crusty old dudes with snorkel-equipped Wranglers, Fiat just has to make sure its pint-sized product doesn’t tick them off too much. “Honestly, we’ve got such a clear definition of what the Jeep is … and we don’t want to screw it up,” Morrison says. Despite the fact that one can buy a Renegade with front-wheel drive—instead of four-wheel drive—the Renegade appears to be negotiating this tricky territory with aplomb. In the U.S., virtually all the Renegade buyers to date are new to the Jeep brand. They are people that otherwise would have bought one of the other subcompact crossover SUVs, so-called “cute utes” like the Chevrolet Trax, Kia’s Soul, and the Nissan Juke. Meanwhile, the company is still selling more traditional Jeeps than ever. Morrison says Renegade sales have been particularly strong in the Northeast and in California. The vehicle is easier to find there. 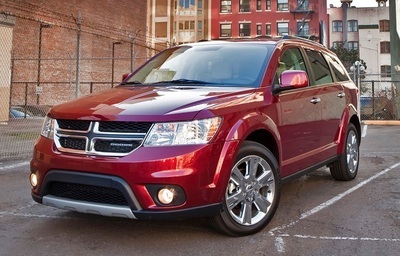 We last reviewed the 5-passenger Dodge Journey some years ago before this current generation and we were not impressed. That one came out in 2008 and was rather cheap and tawdry both inside and out, as well as being seriously underpowered. Bravo for Dodge in bringing this mid-size, three-row-optional, 5- or 7-passenger crossover up to date both aesthetically and functionally in 2011. The redesign, impressively, happened not long after the company came out of bankruptcy. Our all-wheel drive test vehicle is nicely appointed and with the bigger of two engines, much better interior and thoughtful chassis improvements it performs very well indeed. This Journey comes in seven models, from the bottom end “American Value Package” starting at $20,695 with the 4-cylinder engine, seating for 5 and antiquated 4-speed automatic transmission to the full-zoot “R/T” starting at just over $31,000. Our tester is the “Crossroad” model starting at $26,595 and representing the fifth of the seven trim levels. This one also happens to be loaded with extras like: Seating Group (second row tilt, slide and fold), third row seat, heated seats and steering wheel, remote start, premium sound, navigation, rear seat entertainment and power sun roof. The list is much longer but those are the major elements. Our sticker shows just shy of $36,000 on the bottom line. Exterior styling and design will turn no heads even in the rich blue of our tester. It is rather boxy, as you might expect with a crossover that, by its very nature, must maximize interior volume. Character lines and other styling niceties are minimal. The characteristic Dodge cross-hatch grille leaves no doubt as to its brand. The overall styling is undistinguished but reasonably attractive except for a jutting chin-like trim element below the grille that looks exaggerated, almost like a push bar. The medium-tall stance and trucky profile contribute to its identity and purpose. Our Crossroad model comes with 19-inch painted aluminum wheels giving it a meaty and dramatic look. Most improved over the past version is the Journey’s interior. The design is incrementally improved and the materials are much nicer than the past generation including softer touch materials on the dash and door panels. Stitching in the door panels hint at upscale values. Knobs continue to be used where they are most efficient and the 8.4-inch infotainment/navigation screen is well designed with large icons and mostly intuitive functions. Seating is generous and comfortable, though I’d not want to have to wedge into the third row seats. Those should be reserved for little people and pets. Access to the third row, though, is easier than most with pull straps to fold the second row out of the way. Fold both the third and second row seatbacks out of the way and you’ll have over 67 square feet of cargo space – better than a few in the class, less than others. Two powertrains are available in the 4,200-pound Journey – a 2.4-liter 4-cylinder with modest power and this PentaStar 3.6-liter V6 mated to a 6-speed automatic transmission. The latter was rated as one of Ward’s Autoworld’s 10 Best engines in 2012 and 2013 for good reason. It is smooth and efficient as well as being versatile enough to power everything from the Charger and the Chrysler 300 to this Journey. With a decent 283 horsepower and 260 pound-feet of torque the high-tech engine is rated at 24 mpg on the highway and 16 in the city. Those are not great numbers but considering the size and capability of the Journey they are not too bad. We averaged just over 21 in our week of mixed driving. The 4-cylinder engine rates only one click better on the highway mileage. With a 20.5-gallon fuel tank we have close to a 500-mile cruising range. On the road we found the V6 engine and this well-managed transmission to be a fine combination. While it did not downshift as quickly as some when trying to accelerate from 50-mph cruise by just punching the go pedal, it was quick enough when using the manual mode on the shifter. Off the line with your foot in it we get a different impression. First and second gears come on quickly and strong making an impressive 0-to-60 time of just over 7 seconds – not bad for this type of vehicle. Considerable chassis and suspension updates during the last update make for tighter handling and a more controlled ride. It is very well balanced between firmness and comfort. With the V6 engine and a trailering package you can tow up to 2,500 pounds and you can get the trailer sway control function as well. The Dodge new vehicle warranty covers the Journey for 3 years or 36,000 miles and the powertrain for 5 years or 100,000 miles. As we spent our week with the Journey we got well acquainted and thought it would be an easy vehicle to live with, particularly for us older folks. With easy ingress and egress, a reasonable level of luxury, excellent performance all around, good cargo capacity and conservative looks it could suit us well. There are many choices in this segment, some with more panache, some with more sophistication, many pricier. This one should be on your shopping list. A year and half after it entered Jeep showrooms it’s safe to call the Jeep Cherokee an unmitigated success. With nearly 180,000 units sold last year the Cherokee was the second-best selling nameplate in the Jeep line up, coming within 5,000 total annual sales of Jeep’s much-lauded Grand Cherokee. It was also the third best selling vehicle in the entire midsize SUV category. Traditional Jeep fans, as well as buyers new to the brand, snapped up the curvy crossover despite a somewhat rocky start that included multiple launch delays and controversy over the Cherokee’s non-traditional styling. The Cherokee’s sales success has continued in 2015, with 67,000 sold through April (putting it ahead the Grand Cherokee by 8,000 units thus far). At Kelley Blue Book we’re tracking the entire Jeep brand’s year-to-date sales at over 250,000 units, putting it up more than 20 percent and on pace to hit one million annual U.S. sales — a first for Jeep. A recent drive through the Rocky Mountains in a 2015 Jeep Cherokee helped me understand why this vehicle, and this brand, are doing so well in the ultra-competitive U.S. car market. My Cherokee was a well-equipped Limited model with a 4×4 drivetrain and wearing a deep shade of True Blue paint. It was outfitted with the Luxury, Safety, and Technology option groups, which meant it was equipped with everything from ventilated leather seats to radar cruise control to blind spot detection, parking assist and forward collision mitigation. This combination of premium and high-tech safety features, complimented by the large 8.4-inch central touchscreen and bright gauge cluster display (with its own 7-inch information window), gave the Cherokee a premium vibe. The Cherokee also benefits from Chrysler’s Uconnect Access system for audio, phone, navigation and mobile app control. Uconnect Access remains the best high-tech interface in the automotive industry. Of course with an MSRP of $37,215 this Cherokee needed to feel upscale. The starting price for a 2015 Cherokee Sport with front-wheel drive is just $23,990, including destination charge. That base version still offers a 5-inch touchscreen, 17-inch wheels and a 9-speed automatic transmission hooked to a 2.4-liter 4-cylinder “MultiAir2 Tigershark” engine. The 4-cylinder makes 184 horsepower and 171 pound-feet of torque, but when scaling Colorado’s 10,000-plus-foot passes I was glad to have the larger 3.2-liter Pentastar V6 with 271 horsepower and 239 pound-feet of torque. This engine also pairs with Jeep’s 9-speed auto, and when combined with the more advanced Active Drive II 4×4 system it’s rated at 22 mpg combined. The Active Drive II 4×4 system offers a 4-Low mode with a 2.92:1 gear reduction for climbing and descending steep terrain. It features Jeep’s Selec-Terrain system with a dial in the center console to modify how the 4×4 system reacts for different driving conditions. The dial’s settings are Auto, Sport, Snow and Sand/Mud. The Selec-Terrain system is also included with the Cherokee’s less advanced Active Drive I 4×4 system, though that system doesn’t offer a low range. I utilized the Snow mode several times when the road was covered with said material, and it definitely added to my confidence in the blizzard conditions I encountered on Monarch Pass. True off-road adventurers should opt for the Cherokee Trailhawk, which starts a $30,790 and comes standard with a lower final drive ratio and a locking rear differential, plus a fifth Selec-Terrain setting: Rock. I never had need of the Trailhawk’s locking differential, nor the Hill-descent Control and Hill-ascent Control offered on any Cherokee with the Active Drive II system (when in 4-Low mode). But I did transport a large amount of luggage and equipment between Denver and Crested Butte, and the Cherokee’s cargo area proved adequate, if not vast. At 24.6 cubic feet of volume the cargo area isn’t as large as some of the Cherokee’s primary competitors, though folding the second-row seat down expands that figure to 54.9 cubic feet. If that’s still not enough you can fold down the front passenger seat to eek out 58.9 cubic feet of storage space. This assumes nobody wants to ride with you. Some other key points I discovered during my Colorado adventure with the Jeep. First, the narrow headlight design that caused so much consternation before the Cherokee was released? Whether you like them or not I can assure you they are fully effective, throwing abundant light on twisty mountain roads in the dead of night. During a blizzard. Conversely, the heavy snow I drove through pretty much neutralized the Cherokee’s front sensors for the forward collision warning and radar cruise control systems, resulting in a repeated “wipe off sensors” message in the gauge cluster. Call it an effective preview of the challenges engineers will face as we move toward autonomous vehicles. The somewhat cramped interior space and clogged front sensors were the only negative items I encountered, and neither were enough to squelch my enthusiasm for Jeep’s new midsize SUV. This is a capable vehicle for a variety of needs. It’s got enough power and refinement to satisfy urban commuting needs in front-wheel-drive form. And when equipped with its optional 4×4 system the Cherokee will deliver extreme off-road prowess (hyper extreme in Trailhawk form). Finally, buyers seeking a sport utility vehicle with high-tech luxury and safety features will find a long list of optional equipment to choose from, assuming they are okay with a rapidly rising MSRP. The 2015 Jeep Cherokee is competing in today’s hottest market segment, yet its continued success confirms the wide ranging appeal it delivers. It will play a key role in Jeep’s ongoing growth in the U.S. and globally.